The study of happiness has become an important focus in the fields of social sciences, anthropology, economics, and more. 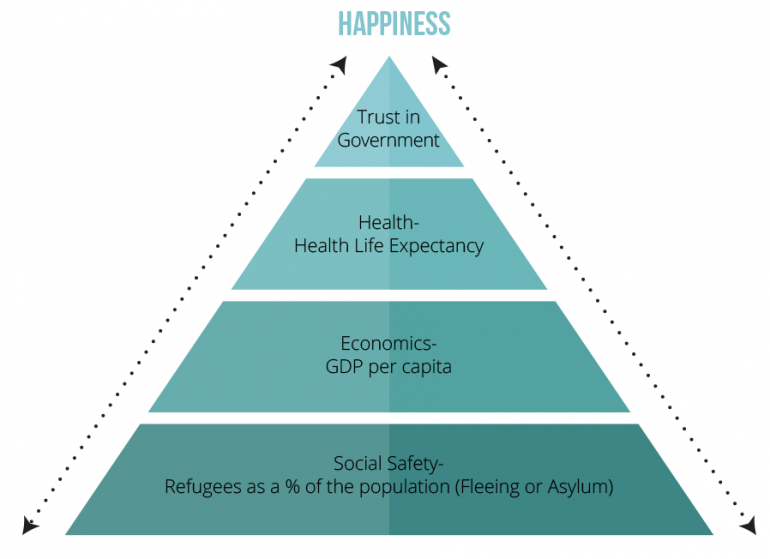 The United Nations and the World Bank are also very interested in the state of the world happiness and refugee trends (respectively), and the Global Happiness Council, which is behind the world happiness research, are specialists with a team of experts in happiness and well-being. Why so much attention to happiness? Because being happy makes us healthier, more productive, and nicer people. And because happiness is an important and useful way to guide world policy and measure its effectiveness. Over the last decade, the trend has been for local and national governments to use data on happiness to shape policies that enhance the lives of their citizens. Now we are getting somewhere. Recently in-depth analysis was also done on subgroups of the populations. Not only were people from different countries asked about their happiness, but people with unique statuses were also researched—one especially interesting group being migrants. Researchers wanted to know if migrants moving from one country to another or from the country to the city were happier than they were in the past. The study was released at the Pontifical Academy of Sciences in the Vatican; a launch event was also held at the United Nations as well. After diving into the data from this report (kindly shared on Kaggle), we were very keen to find out which questions were asked to determine people’s happiness scores. Was it based on just one question or was it a combination of several measurements? Did the research create a new way to quantify happiness? Please imagine a ladder, with steps numbered from 0 at the bottom to 10 at the top. The top of the ladder represents the best possible life for you, and the bottom of the ladder represents the worst possible life for you. On which step of the ladder would you say you personally feel you stand at this time? Thousands of people from around the world answered this question, which determined their subjective happiness level. After collecting the answers on a country level, the researchers gave each country an average happiness score. Then all the countries in the world were ranked. 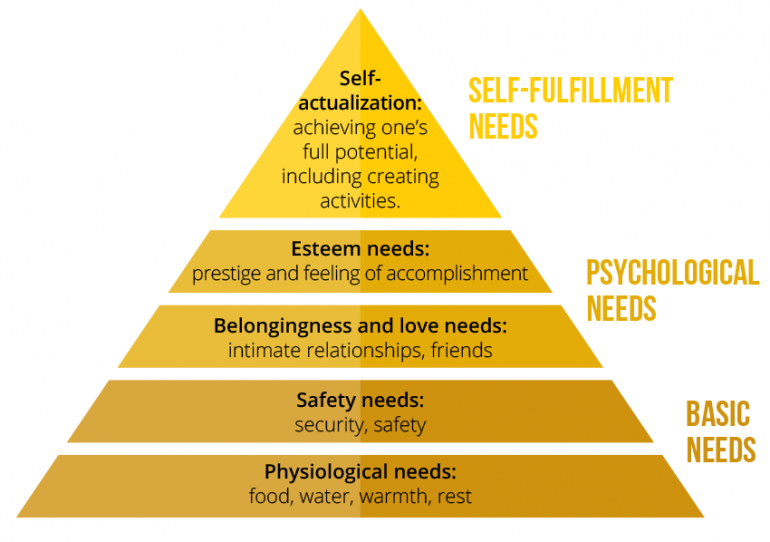 In order to describe the human motivation and psychological development, Maslow (a famous behavioral researcher) created a hierarchy of needs, presented as a pyramid with the most fundamental needs at the bottom—physical needs and security, etc.—whereas friendship, love, and self-transcendence were at the top. Maslow’s theory suggested that the most basic level of needs must be met before the individual will strongly desire (or focus motivation upon) the secondary or higher-level needs. In our analysis, we didn’t assume a one-way direction of influence from to bottom to the top, as like Maslow’s hierarchy of needs expected. Our study assumed a two-way relationship between subjective happiness and other indicators of a country. Indeed, a higher GDP (Gross Domestic Product) can improve the subjective happiness score of people, but also happier people also can be more productive than non-happy people, thus increasing the GDP. Also, being happy can improve people’s health and being healthy can improve people’s happiness. Where are Billions of People Happier? Happiness reports highlight year after year that the Nordic countries (Denmark, Norway, Finland, Sweden) are achieving the highest happiness scores in the world but not that many people live there, and we were intrigued to see which continents are happiest. We explored and adjusted by population size the happiness score and rank of regions and countries, and we found that on a continent level there are happier people in the Americas than in Europe or Asia or Africa. The table below is one of a few that we created based on the regionally- and population-adjusted happiness score. The American Continent has the highest adjusted to population happiness score at 6.57. The European Continent has the highest GDP, the highest Health Life Expectancy, and the highest Trust in Government. The Asian continent has the most amount of people living there, and the lowest trust in government. The African Continent is way down below in happiness suffering from millions fleeing and low GDP, low Health Life Expectancy and low Trust in Government.? There have been refugees in the world for hundreds of years, people fleeing from one region of the world to another to escape strife and seek a better life. Studies are now being conducted to understand their happiness levels. 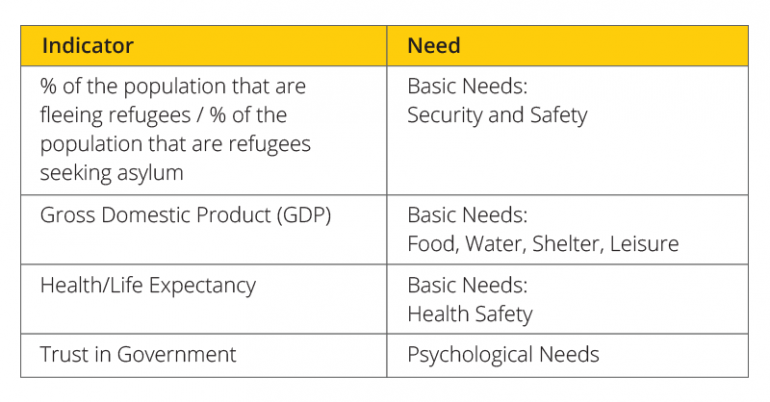 We examined the countries accepting refugees seeking asylum; the data indicates that countries accepting refugees are not worse off, on the contrary, their population is subjectively happy. This implies that refugees are fleeing from places of danger and hardship to places where people are safe, healthy, fed and happy. So, happiness does matter. As individuals and as a world.